While the exact circumstances behind the demise of the Prelude are unclear at the moment, Burns is now one of many people left without a car after the storm—and the Instagram page that boasted of its destruction has gone private. Burns told Jalopnik he bought the red Honda Prelude off of his friend just a few months ago. It needed some work, he said, so he set to completing an engine swap and tailoring it to fit his daily-driving needs. To celebrate his buddy’s birthday, they drove the now-working Prelude down to the beach in Port Aransas. Unfortunately for Burns, his Prelude’s transmission gave out and he couldn’t afford to tow it back the two hour drive home, so he left it parked by the beach. A week later, Hurricane Harvey came blowing through Port Aransas before Burns could recover the car. The town was completely devastated by the storm. But Burns explained that he had started a new job and couldn’t get to the car before the hurricane came, so he left it and hoped for the best. 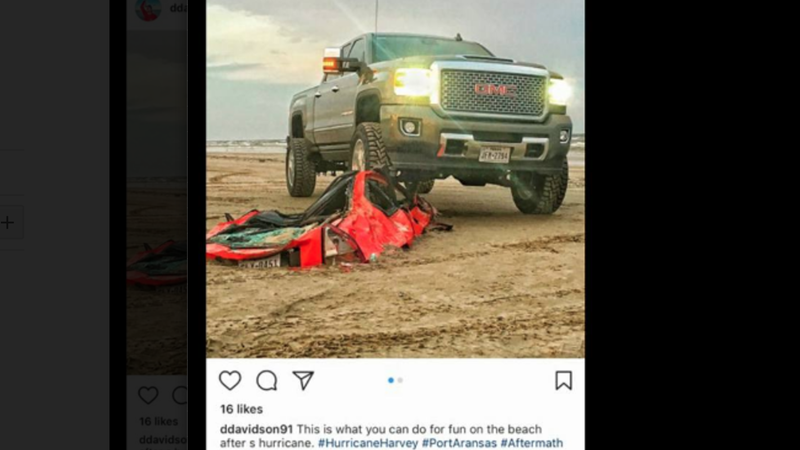 A few days after the hurricane, Burns said a friend tagged him in a post, asking if it was his Prelude buried above the windows with the roof completely crushed in on the beach of Port Aransas. It was. Attempts by Jalopnik to contact the user behind the Instagram account have not been successful. A direct message on Facebook to a user believed to be the same person was not replied to. It must be noted that exactly what happened here is unclear. Since the photo doesn’t actually show the truck on the car or driving over it, and since the account owner commented that they weren’t the first ones to find the car, it’s possible it was crushed by someone else. It’s a bizarre thing to take credit for, through. Burns said he hasn’t gotten a chance to go down and see his car yet, and he’s not even sure if it’s still there. He says nobody has reached out to him about it. Considering its condition, there’s likely no chance in salvaging much from it. Burns says he doesn’t have another car at the moment, but he has been using a friend’s motorcycle. He’s worried that he’ll have to find something else for the winter. A GoFundMe has been set up mentioning funding a new car for Burns and also potential legal action against the people who allegedly ran over it. Burns says the car was still registered in his friend’s name and the friend is the one seeking legal advice. 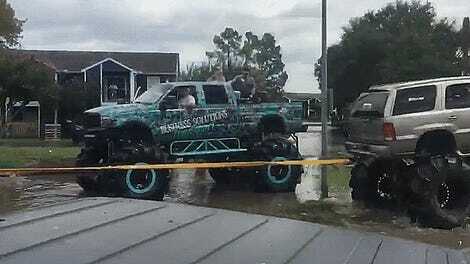 It’s a good thing we saw much better examples of car people standing up to help during the hurricane than whatever this mess is. Best of luck to Chris and everyone else affected by the storm. Update, 6:27 p.m.: The Instagram user who holds the account that posted the images contacted Jalopnik and claimed it wasn’t his truck. He claims he stopped someone and asked to take the photos, and then removed the images from his account once he realized the truck’s license plate was uncovered. He also claims he has no idea who the person was, but he’s been contacted by the owner of the car, and told them the same thing. Additionally, Burns updated me to say the car is out of the sand now.